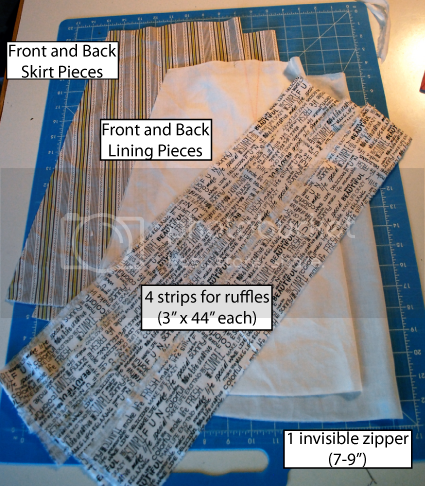 The Essential A-Line Skirt, Part 3: The Double Ruffle - Stop staring and start sewing! Now that you've worked the bugs out of your pattern it's time to start having some fun! 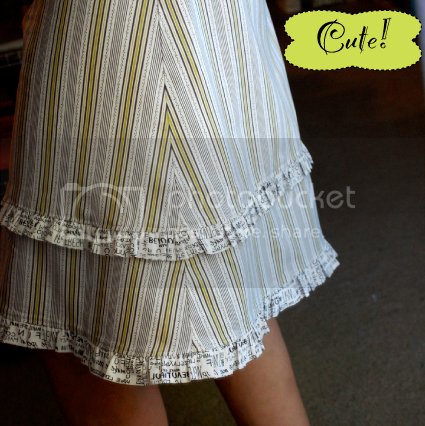 This Double Ruffle version is cute and whimsical without being too silly. I love this ticking fabric from Sweetwater's Make Life collection and the fabric with the words on it was just enough fun stuff to keep the skirt from taking itself too seriously. Refer to the previous tutorials for information on preparing your pattern and assembling your basic skirt. This tutorial builds on the previous tutorials. 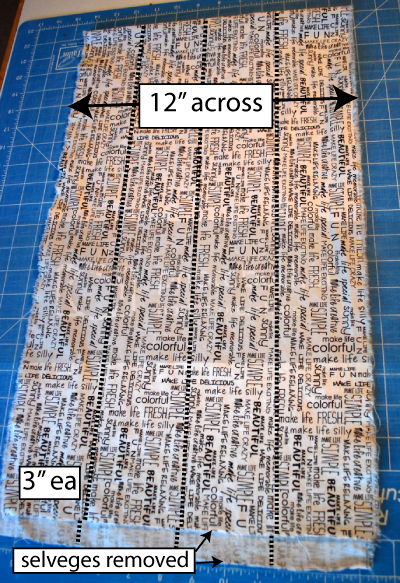 For this version you need your usual fabric (1.5 yds main fabric, 1 yd lining) and a 7-9 inch invisible zipper. PLUS you will need 12 inches of a coordinating fabric for the ruffles. 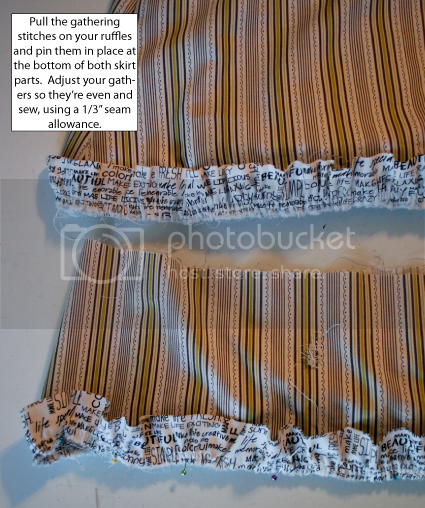 Remove the selveges from your ruffle fabric and cut it into 4 strips. Each strip will measure 3 inches by 44 inches. Here are all the ingredients for your skirt. Don't forget to mark the front and back pieces in a discreet spot. 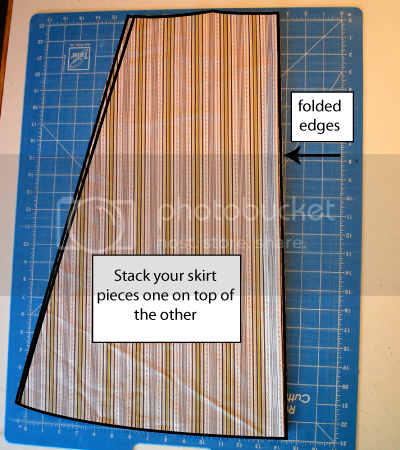 Stack your main skirt pieces together and make sure the folded edges and bottom edges line up with each other. 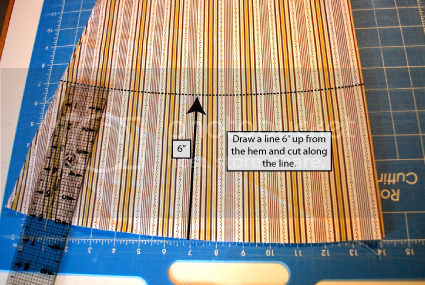 Mark a line 6" up from the bottom and cut this portion of your skirt pieces. Stop and mark the front and back pieces (on the wrong side) so you line them up correctly when your skirt goes back together. 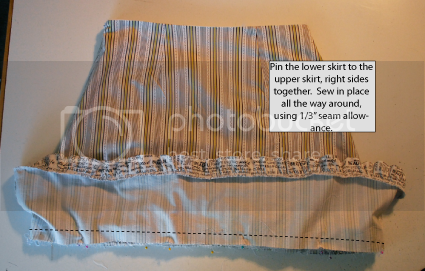 Finish the top portion of your skirt using the same method shown in the second tutorial. 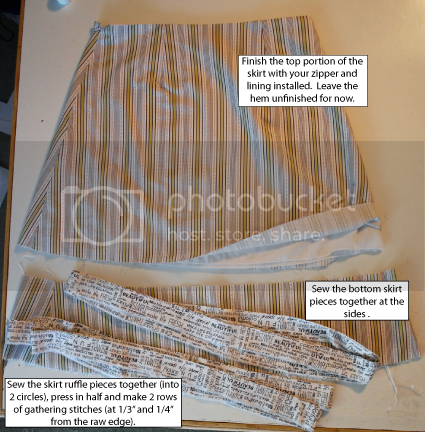 Sew the bottom skirt pieces together on the sides using the same seam allowance you used on the top of the skirt. 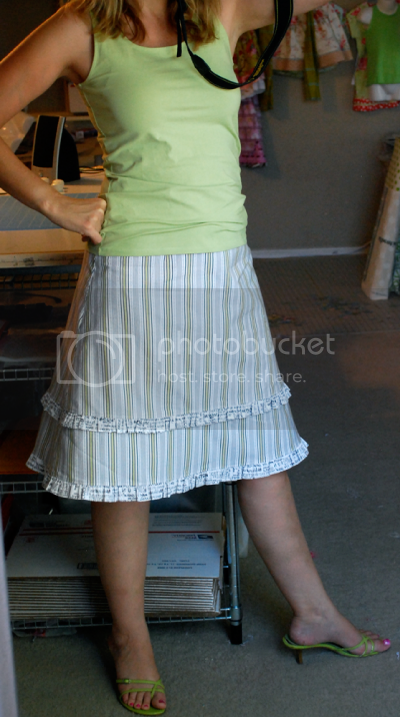 Now pin your gathered ruffles to the bottom of the top skirt portion and the bottom skirt portion. Once you've got them evenly adjusted, sew in place using a 1/3" seam. 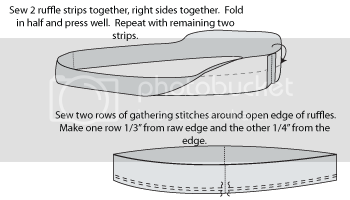 Now pin the top skirt portion and the bottom skirt portion together with the right sides facing each other. Your upper ruffle will be sandwiched between the layers. Now stitch in place using a 1/3" seam allowance. 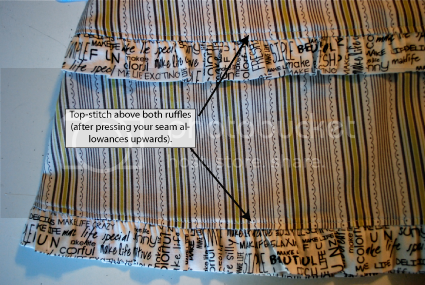 Press your skirt firmly and make sure both seam allowances are pressed upwards. Now top-stitch on the outside of the skirt just above the ruffle. Now put some cute shoes on with your skirt and get out of the house! Great job!